The Saturday morning announcement that the US and Russia have agreed to join forces to pound ISIS in Syria starting Monday is evidence that the Assad regime’s strategic narrative is dominating the narrative space through which the international community views the conflicts. The regime’s narrative paints ISIS as the center of gravity in Syria – a strategically prudent representation. Destabilizing the prism through which the regime and the opposition (writ large) represent the nature of the conflicts, yields some interesting moral contraband. The regime wants to portray what is happening in Syria as a sectarian civil war. The opposition, as diverse as it is, has at least two things in common: 1. They all benefit from representing a unified opposition. 2. They benefit from framing events as part of a popular revolution. Title: This is a sectarian civil war. Syria is a secular state fighting Islamic extremists as part of the “war on terror” that the international community is engaged in. Title: This is a revolution not a sectarian civil war. This conflict is part of a popular revolt, part of the Arab Spring, driven by a desire for social justice rather than exclusively driven by Sunni sectarianism. These are the narratives that are being projected out from Syria to the international community. They are strategic. They are self-referential. And like all narratives, they accentuate some events and diminish others, they structure an understanding of the world, attribute motives to actions, and compile events and experiences into meaningful structures. Narratives that influence, help people see a pattern where before there was just data. Without even looking at the narrative, just analyzing the frame, yields implications that are not overt. If the Syrian conflicts are framed as a civil war, a particular version of events that emerges that projects the sovereignty of the state, and the head of state, and implies the illegitimacy of foreign opposition to the Head of State. It also Implies an equality of power between the state and its apparatus and what were at one time unarmed civilians, thereby marginalizing the ethical, or unethical, unfolding of events. There are also strategic historical oversights. This narrative frame effectively separates the events in Syria as distinct from the rest of the Arab Spring movements. And it ignores the historical genesis of the conflict beginning with the spray painting by the Daraa teenagers. And, by using the “war on terror” frame, and emphasizing the jihadi element of the opposition, it triggers the international community’s identification as participants of the “war on terror” specifically of the jihadi variety. Framing the conflict as beginning with a popular revolt connected with the Arab Spring, legitimizes and encourages international intervention. Framed this way, it seems conceivable that the international community can arm the opposition, reject dialogue with the regime, and indict Assad for war crimes. The opposition’s Master Narrative is a complicated one. While sectarian tension are acknowledged, particularly Sunni-Alawite hostilities, as the narrative presents it, the civil conflict cannot be reduced to a sectarian one. It suggests that the conflict has multiple dimensions like territorial, ethnic, class tensions and international interests. Despite the competing interests of oppositional forces, the strategic narrative they are interested in projecting is one of a unified opposition. Very recently, for example, the group formerly known as al Nusra Front, now called Jabat Fateh al-Sham (or JFS) has actively been using Western media to relay its narrative that its split from al-Qaeda has had the effect of uniting various opposition groups. Its spokesperson has been given the job of dealing with foreign media and has been described as their most powerful weapon, indicating an acknowledgement that Western media and foreign audiences matter to this conflict and that non-kinetic influence is central to this fight. Whether or not the split with al-Qaeda has actually had the effect of uniting rebels (and there is considerable doubt about that claim) what is clear is that the narrative of unity is what the JFS wants to establish. However, this particular narrative is losing on the international level. One reason it is losing, in my opinion, is that it has become reactive. It has become a counter-narrative and counter-narratives are defensive and not as influential as offensive narratives. In fact, anyone who wields a counter-narrative needs to be very careful about back-fire. Another reason it is losing is that it is too complicated and the jihadi element breaks the narrative continuity from the Arab Spring. The European Institute of Peace conducted a media monitoring study of global media coverage of Syria from Oct. 2015 to Feb. 2016 and found that terrorism and conflict received 48% of international media coverage, women and children received less than 3% of the coverage, the humanitarian crisis, 3%. 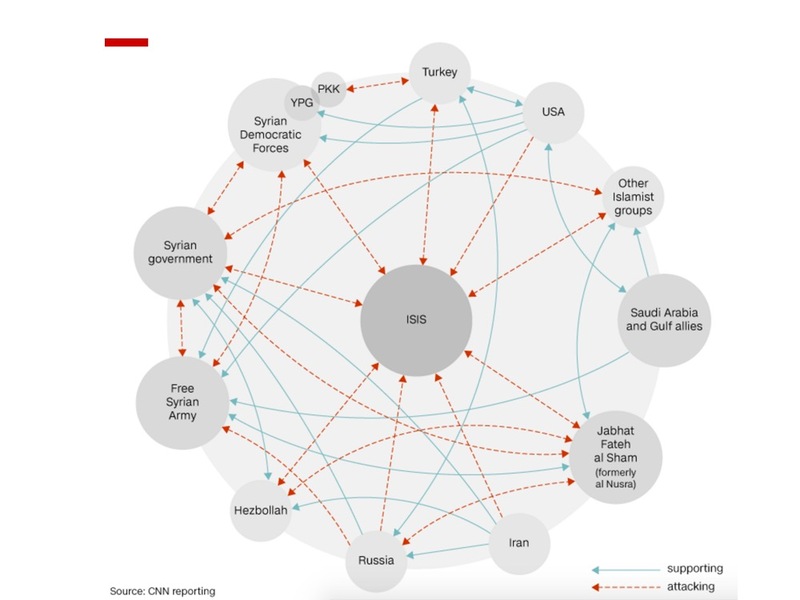 The centrality of terrorism and of ISIS in particular to the media’s frame of the Syrian conflicts is demonstrated by this CNN graphic which depicts ISIS as the center of the universe. The Meta Narrative Frame created by global media is the prism through which the international community views the situation and it determines how conflicts are perceived and how events and actors are understood. It does this by selecting which aspects of the conflict are emphasized, which topics are highlighted and which actors are identified, and how motivation is assigned to the actors. The actions we take will depend, in part, upon the possibilities implied by the Meta Narrative. The shared understanding of what is real and possible can transform an actionable environment; it can influence social movements and eventually international actors, and state policies. Narratives based on the actions of violent non-state actors dominate Western understanding of the Syrian conflicts. And why is that? Because the powers that benefit from promoting and continuously repeating that narrative understand the strategic importance of dominating the narrative space. They are skilled at narrative deployment. The international community will not find it credible nor feasible to generate stability against the Meta Narrative on Syria that is dominated by terrorism committed by non-state actors. About Ajit Maan, Ph.D. is President of Narrative Strategies, partner at WeSolve, Affiliate Faculty at George Mason University, author of Counter-Terrorism: Narrative Strategies, and editor of the forthcoming volume Soft Power on Hard Problems: Strategic Influence in Asymmetric Warfare.